The PlayStation Phone finally lands - but can it live up to the hype? An interesting take on the PlayStation phone concept that still leaves a lot to be desired in terms of gameplay and hardware design. The PlayStation phone is the device equivalent of El Dorado, in that it's spent a long time as a golden fable to trot out when conversation slows. Now the fusion of gamepad and Android phone has emerged into the modern world in the form of the Sony Ericsson Xperia Play. It's a time when iPhones have permeated the globe, able to deliver tactile gaming on the go, and Nintendo's 3DS is making waves by bringing portable 3D fun to the masses. Even within the Sony stable, the Xperia Play has rivals to overcome. There's the NGP, successor to the PSP, on the horizon, which will arrive boasting enough processing power to run the LHC (well, a quad-core CPU and graphics processor, at least). What's more, it must establish itself over a selection of fast and competent Android handsets, such as Sony Ericsson's Xperia Arc, which will also have the chops for 3D gaming of the non-stereoscopic kind. 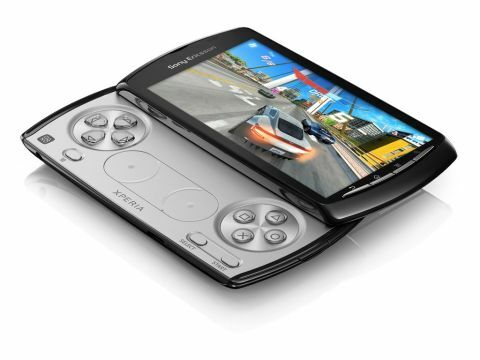 Our colleagues at T3.com grabbed some Sony Ericsson Xperia Play video which you can watch below. As a gaming-oriented mobile, the headline feature here is, of course, the slide-out controller section. This comes bearing a D-pad, the familiar PlayStation face buttons, a pair of touchpad 'thumbsticks', two shoulder buttons and some menu keys. There's also an accelerometer on board, and the four-inch 480 x 854 multi-touch screen for getting all handsy with your software. Powering this is a 1GHz Snapdragon processor with embedded Adreno 205 GPU graphics, 512MB of RAM and Android 2.3, or Gingerbread. While that's competitive in terms of modern smartphones, we have to admit we were expecting more pixel-pushing oomph. Rounding out the offering are a smattering of features, including Wi-Fi and 3G connectivity, 5MP camera, Bluetooth and a bundled 8GB microSD card. Okay, now you know what's on offer, let's talk price. SIM-free, the Xperia Play will require a £480-520 extraction from your wallet, and to get the phone free on a contract will typically require paying £35-40 per month. To put that in perspective, you could get the much-lauded Orange San Francisco and a 3DS for the same cost as a SIM-free Xperia Play, with change enough for a small library of games. For this kind of money, you'd be right to expect legendary performance. The Xperia Play hardware itself isn't unattractive, but it is bulky, coming in a finger-width shorter than a closed 3DS and a few millimetres less thick at 62 x 119 x 16.5mm. It's heavy as well, and feels too plasticky in the hand, mainly thanks to the creaky, glossy backplate. Oh, and the whole device retains fingerprints better than a crime lab database. Holding the phone upright as you would to make a call, along the left-hand side of the slide-out section is a 3.5mm headphone socket and the micro-USB port. We're not huge fans of how the jack is placed, given its location makes the provided headphones rub against the base of our thumb while playing games and gets in the way for movies. On the top edge of the phone is another less than ideally placed button – the power/lock switch. Because it's recessed, it requires a fair flex of the index finger to operate, which can be faffy at key moments. The right-hand side has the shoulder buttons (more on them in a bit) and a volume rocker, which is in a great place for adjusting volume on the fly during calls, but awkwardly right behind the middle of the screen during gaming. There's a minimal selection of non-backlit buttons along the bottom of the screen too to handle navigating duties. These are: Back, Home, Menu and Search respectively. They're pleasant enough to use, but we think you'll find it hard to make them out in the dark. One neat touch is that when you flip the phone over and take off the backplate, you can access the sim slots and microSD card without removing the battery. Not quite the killer start we'd hoped for, but we've yet to venture onto the Xperia Play's home turf: gaming.